Don't Just Learn Guitar. Learn To Be Yourself On Guitar. News: fretjam is currently being redesigned to be more mobile and tablet friendly. This will take some time, so thank you for your patience! The site will remain live as normal as pages are updated. Please consider donating if this site has helped you. Thank you. I really appreciate it! Spice up your songwriting. Learn how the dominant function in music can help us change to any key, major or minor. In depth guitar lesson with video. Learn how to use the CAGED system to extend and colour major chords and create vibrant, easy to play voicings all over the guitar neck. Includes video demonstration and chord charts. 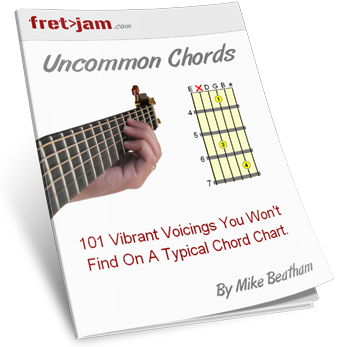 Learn about borrowed chords, how to use them in your songwriting and how to solo over them. Includes in depth video, ear training and tables showing how borrowed chords work in several keys. Learn the ways diminished 7th or dim7 chords can work in your music with this in depth guitar lesson. Includes several progression examples and a video overview. Learn how to play triads in relative positions to the chords you're playing over to give your chord and lead playing more mileage. In depth guitar lesson with video and tabbed examples. Learn how major 7th arpeggios can be used over all chord types, not just maj7. This guitar lesson will take you through the basics of major 7th arpeggios and how to use them in your solos. Learn how to harmonise using 6ths right across the guitar neck and create beautiful sequences. This lesson will show you how to harmonise any chord in sixths. Learn how to create musical phrases over minor 2 5 1 using these pentatonic scales. Video and tabs show you how to play the right pentatonic scales so you sound great every time. A learning path from beginner right through to advanced theory and techniques. No logins, just quality free guitar lessons when you need them. Get expert help in overcoming your guitar learning obstacles. Here, there's no such thing as a "stupid question" and the answers are in depth. Essential tips that will put you in the right frame of mind for learning guitar, including FAQs and checklists to ensure unstinted progress. The web's best learning tools, hand selected in one place. Reach your fullest playing potential with backing tracks, software and specialised courses.